The most common side effects of Xeljanz include upper respiratory tract infection, cold-like symptoms, diarrhea and headache. The arthritis and colitis medication can also cause more severe problems such as serious infections and cancer. In February 2019, the U.S. Food and Drug Administration warned of a study that found an increased risk of blood clots in the lungs and death in patients with rheumatoid arthritis who took a higher dose of the drug. Xeljanz and Xeljanz XR are Janus kinase (JAK) inhibitors that treat rheumatoid arthritis, psoriatic arthritis and ulcerative colitis by regulating the activity of the immune system. Tofacitinib is the active ingredient in the drug. Most of the drug’s common side effects are minor and range from headaches to cold-like symptoms. But the drug also carries a black box warning for serious infections and malignancies such as lymphoma. Between 2013 and 2018, the FDA Adverse Events Reporting System (FAERS) received 42,528 reports of adverse reactions for the two drugs. Of these, 14,679 were serious and 983 involved deaths. The data from FAERS are self-reported, and the U.S. Food and Drug Administration cannot verify if they are accurate. But the agency will sometimes use them to determine if it should get more data on certain adverse effects. From 2013 to Dec, 31, 2018, the FDA Adverse Events Reporting System (FAERS) received 42,528 reports of adverse reactions for Xeljanz and Xeljanz XR. On Feb. 25, 2019, the FDA released a safety communication to alert the public that a safety trial found an increased risk of blood clots in the lungs and death among people with rheumatoid arthritis who took a higher dose of the drug. After this communication went public, lawyers began investigating lawsuits against Pfizer. In Pfizer’s clinical trials, researchers considered side effects common if they occurred in 2 percent or more of patients who took 5 mg of Xeljanz twice daily or 10 mg twice daily. About 4 percent of trial participants who took Xeljanz quit clinical trials because of adverse events compared to 3 percent of people who took a placebo. The most common side effect in patients with rheumatoid arthritis was upper respiratory tract infection. This occurred in 4 percent of 1,336 patients who had taken 5 mg of the drug twice daily and 4 percent of 1,349 patients who had taken 10 mg twice daily. People with psoriatic arthritis had the same safety profile as those with rheumatoid arthritis. In patients with ulcerative colitis, the most common side effect was cold-like symptoms. This occurred in 10 percent of 198 patients who had taken 5 mg twice daily and 14 percent of 196 patients who had taken 10 mg twice daily. In general, people with ulcerative colitis who took the drug suffered more side effects than people with rheumatoid arthritis who took the drug. While the majority of side effects in clinical trials were not severe, the medicine does have a few serious risks, according to the drug’s label. Some patients shouldn’t take the drug and some might be at higher risk of side effects. Doctors may monitor white blood cell counts, hemoglobin levels and liver enzymes. Infections are some of the more serious risks of Xeljanz, and the risk of infection could increase in patients who take the drug in combination with other immunosuppressants such as methotrexate or corticosteroids. In clinical trials, researchers reported more serious infections in patients who took the drug versus a placebo. Clinical trial participants suffered from infections including pneumonia, cellulitis and urinary tract infections. In general, people who took higher doses had a higher risk of developing an infection. Some infections may require hospitalization or may be fatal. In Pfizer’s seven controlled clinical trials, researchers found that more people who took Xeljanz had serious infections than those who took a placebo. Scientists classified a serious infection as one that required hospitalization or intravenous antibiotic treatment, according to Pfizer’s website for health professionals. Pfizer gathered safety data from studies with 2,300 patients. Of those patients, 9.4 percent suffered serious infection. The drug’s black box warning says that reported infections include tuberculosis, bacterial infections, viral infections such as herpes zoster, and fungal infections, including cryptococcosis and pneumocystosis. Because tofacitinib affects the immune system, it may increase the risk of certain cancers. Pfizer lists these as malignancies in its safety data and includes this information in the black box warning. Taking higher doses of the drug increases the risk. People who have had cancer in the past should consider the risks and benefits of taking the medication. About 3 percent of 2,300 patients who took the drug during studies suffered malignancies. None of the people who took a placebo reported cancers or lymphomas. Lymphoma and non-melanoma skin cancers were the most commonly reported malignancies with Xeljanz. The most commonly reported cancers were lymphoma and non-melanoma skin cancer. Other types of cancer reported include lung cancer, breast cancer, melanoma, prostate cancer and pancreatic cancer. Kidney transplant patients who took Xeljanz with immunosuppressive medications suffered Epstein Barr Virus-associated post-transplant lymphoproliferative disorder, which is a rare disorder than can lead to enlargement of organ tissue or lymphoma. Specifically, the patients took Xeljanz with basiliximab, high-dose corticosteroids, and mycophenolic acid products. In addition to infections and malignancies, Xeljanz’s drug label and safety data warns about herpes zoster, gastrointestinal perforations and lab abnormalities. Tofacitinib may increase the risk of herpes zoster, also known as shingles. According to safety data from Pfizer, the virus occurred more in patients who took Xeljanz than those who took a placebo. In Phase 1, 2, 3, and long-term extension studies with 2,300 patients, 11 percent of patients got herpes zoster. In Phase 3 studies, there were 143 cases. Eleven were serious and required hospitalization or intravenous antibiotic therapy. The risk appears to be higher in patients treated in Japan and Korea. Pfizer recommends patients avoid live vaccines while they are taking tofacitinib. While rare, some patients in clinical trials who took Xeljanz suffered gastrointestinal perforations. In long-term studies of 1,525 patients, three people suffered gastrointestinal perforations. The problems occurred more in people who took Xeljanz with methotrexate, non-steroidal anti-inflammatory drugs or corticosteroids. Researchers aren’t sure if JAK inhibitors played a role in the perforations. Clinical trial participants also had lab abnormalities. Researchers reported decreases in white blood cell counts, anemia, and elevations in cholesterol and liver enzymes. Patients on tofacitinib should have their blood monitored for abnormalities. The tofacitinib Rheumatology Data Safety Monitoring Board During reviewed additional safety data from an ongoing study by Pfizer and found an increase in the frequency of blood clots in the lungs and death in patients who took Xeljanz. The at-risk patients had rheumatoid arthritis and took a higher than normal dose of 10 mg twice daily, a dose not approved to treat the condition. 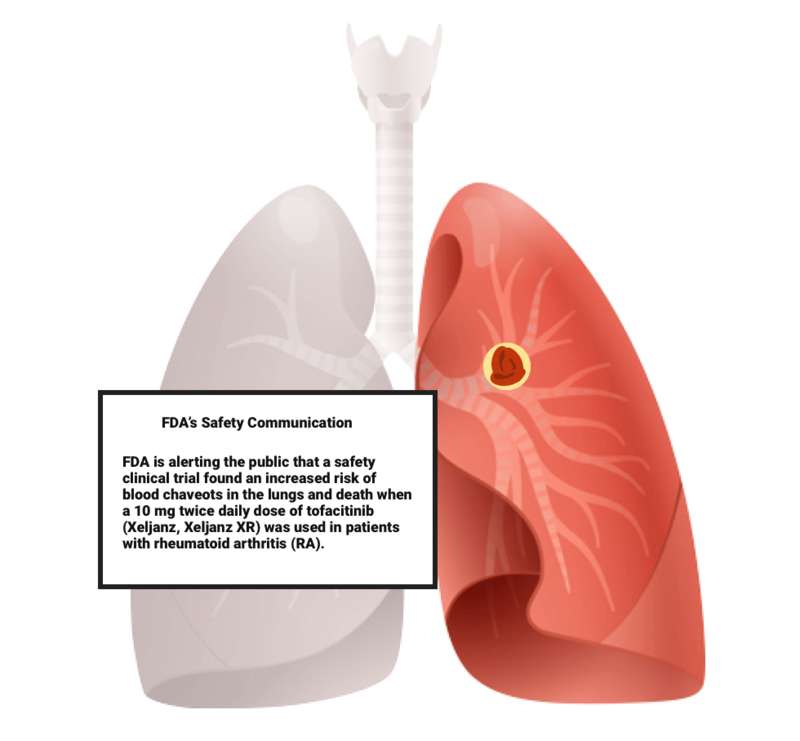 The FDA released a safety communication on Feb. 25, 2019, to alert the public that a safety clinical trial found an increased risk of blood clots in the lungs and death in patients with rheumatoid arthritis who took 10 mg of tofacitinib twice daily. The study, called A3921133, was one of the postmarketing studies the FDA required Pfizer to conduct after the agency approved the drug. The agency released a safety communication about the findings in February 2019, and Pfizer sent a letter to health care providers about the risk. While the FDA did not approve the 10 mg twice daily dose for people with rheumatoid arthritis, it did approve the dose for people with ulcerative colitis. According to Pfizer’s prescribing information for patients in the United States, four people with ulcerative colitis who took the 10 mg twice-a-day dose during a long-term extension study suffered blood clots in the lungs, known as pulmonary embolisms. One of those patients with advanced cancer died. Pfizer does not currently include a warning about a blood clot risk in its Xeljanz drug label. The FDA is working with Pfizer to investigate the blood clots. In the meantime, Pfizer reduced the dosage in the ongoing study to 5 mg twice daily.